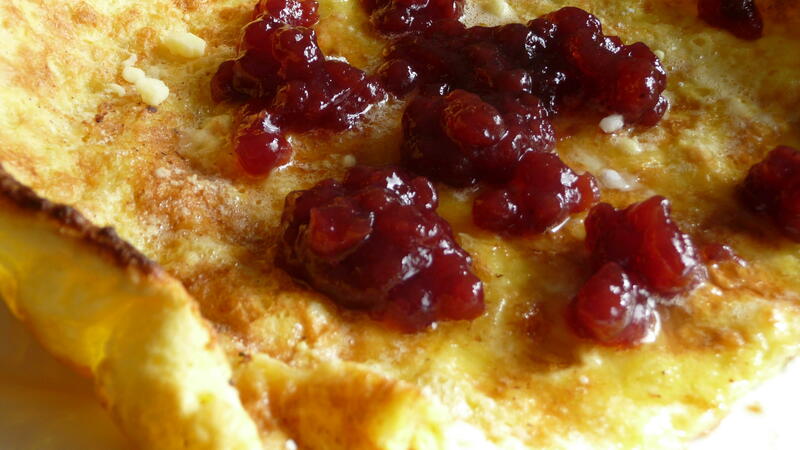 The pancake is perfect with lingonberries on top. To borrow the punch line from a popular joke, my mother’s favourite thing to make for dinner was reservations. While she did make a number of dishes well, she never enjoyed cooking or baking. 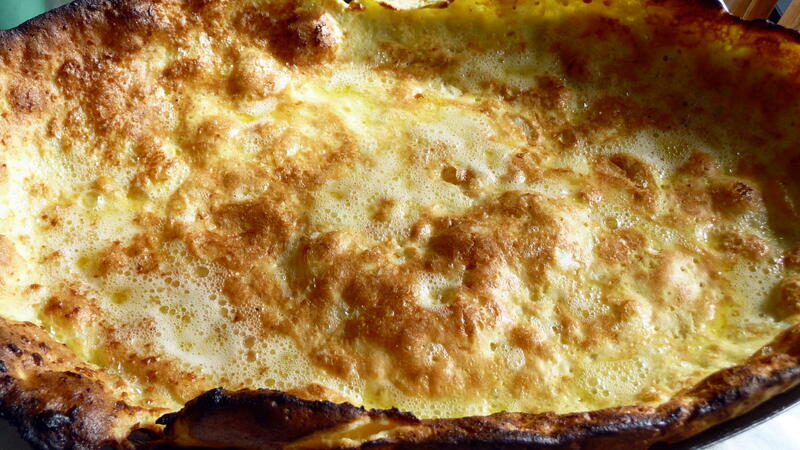 However, we always looked forward to her fluffy golden pancake, which we called a “German pancake”. The main reasons my mother made it were its easy preparation and its simplicity: five basic ingredients – eggs, milk, flour, sugar, and butter – with nutmeg, confectioner’s sugar, and lemon juice as optional enhancements. Just a few basic ingredients make a great pancake. In fact, I think this pancake – which puffs up remarkably then deflates just as dramatically – was the only brunch dish we had at home on Sunday. We always ate it with bacon and lingonberry preserves (if you have no Scandinavian specialty stores nearby, IKEA generally carries it, at a very reasonable price). Both are fine accompaniments for such an impressive yet simple brunch dish. The tangy lingonberries complement the eggy-yet-crisp pancake; by now, we should all know that everything is better with bacon. Mixing the pancake only takes a few minutes. Years later, I came across the recipe in Craig Claiborne’s memoirs-with-recipes, A Feast Made For Laughter. This book, by the way, is well worth reading, for his tales of challenges in his own life growing up as well as the recipes. Mr. Claibrone’s work was sort of a food-blog-before-food-blogs, in a way. So A Feast Made For Laughter is an interesting read, from that perspective of foodblogs as well as an opportunity to learn more about a major American force in cuisine in the 20th century. I recall that my mother did find the recipe in Craig Clainborne’s feature in The New York Times. Mr. Claiborne called it, “David Eyre’s Pancake”. I did not know of the other name until I read the engaging memoir. Call this dish what you like, to adapt an old adage, but I call it the height of pancakeness (pancakery?). Whether or not you read A Feast Made For Laughter, at least try the pancake. It is a recipe, which will make reservations unnecessary for your next weekend brunch. Fresh from the oven, the pancake has just deflated. Preheat oven to 425 degrees. 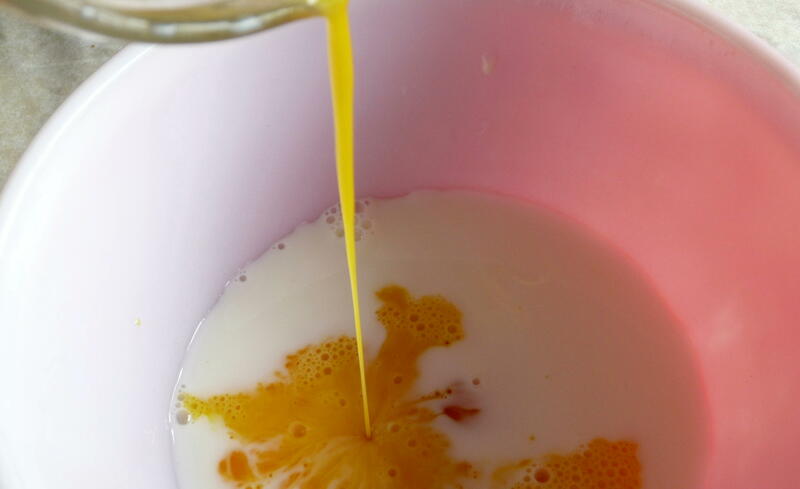 In a mixing bowl, whisk together the milk, eggs, flour, and tablespoon of sugar. Melt the butter in a 12-inch skillet or ovenproof dish, top with nutmeg. Pour the batter into the pan or dish and bake for 20 minutes or until the pancake puffs up and turns golden brown. Sprinkle with the confectioner’s sugar and lemon juice. Watch it quickly deflate! Return to broiler for a minute or two. Serve immediately with jam, jelly, or preserves – preferably lingonberries. This will serve two as a main course, four as a side dish, or just one, who really likes pancakes or has been working hard on a food blog…. This entry was posted in Brunch, Recipes Misc and tagged Brunch, Pancakes. Bookmark the permalink. OMG, I wish I could come over for brunch again! Thanks, Jess. You don’t have to wait until the next Olympics come to Vancouver for a brunch invitation! Dan, I may not have lingonberries, but that won’t stop me from trying your airy-looking pancakes this weekend! Funny thing, my mom was a wonderful cook, but baking was definitely not her forte. So my brother and I would rejoice on the rare occasion she would make dessert. Thanks for the comment, Marysol. I bet you’d like lingonberry preserves – a tantalizing sweet-tary combination. So, if you ever are near an IKEA, you’d be able to find a jar (I think they were $2.99 in Vancouver, last time I bought some). You know my painfully slow internet, so I just got the rest of your blog. 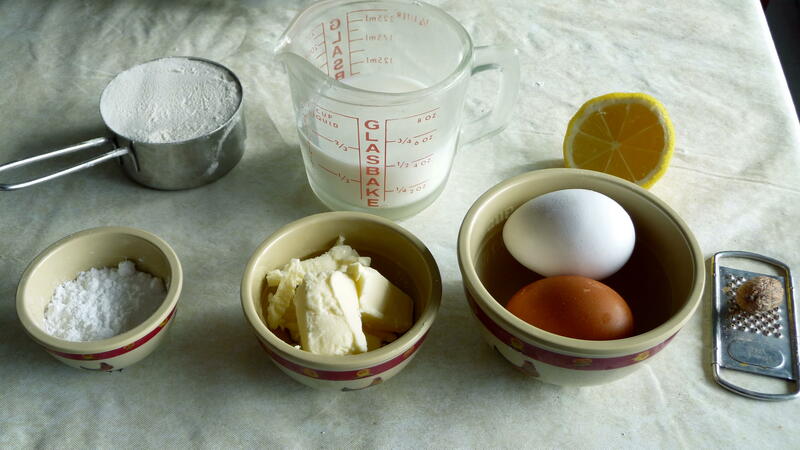 As well as the cupcakes, love the pouring of the pancake batter and your other ones too. It all looks like it is coming together. I think I will actually try the pancakes ( making them, not eating yours). Kip, thanks for checking out the post. Let me know how the pancake turns out for you. Dan, Thanks for stopping by my blog. Your pancakes look fantastic. Thank you for the compliment and for stopping by my blog, too. Merci, Pierre. J’espere que tout va bien chez toi a Paris. WoW!! looks great…awesome for a midday meal. Thanks for the nice remark. Try the pancake – you’ll like it. I am always in search of a good brunch recipe, this looks easy and DELISH! Thanks, Ms. “Figtree”. I think you’ll find it both easy and delish, indeed. I’ve made something very similar to this before, although I just dust mine with confectioner’s sugar…It’s been awhile since I’ve made this, so I think I just found my Sunday breakfast inspiration! I tried your version (minus the lingonberries, though–I forgot to look for them in the store! )…My husband gave me the thumbs-up on this & told me “You can make this again anytime.” Delicious! You’re welcome for the add. 🙂 I do believe the closest IKEA to me is probably somewhere in Minnesota, but I’m thinking that I might be able to get lingonberries from one of the bakers that frequents our farmer’s market. If not, there’s always the beauty of online ordering!